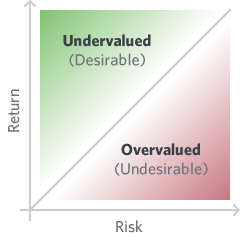 One of the most important frameworks in real estate is to understand risk versus return. The best real estate investors in the worlds have a graph they plot in their head. The more risk they are asked to take on the more reward they expect. The risk vs. return graph is always in flux. As an investor, you want to put your money out above the curve, getting more return than risk (i.e., your money was more expensive than the market price). As a real estate company, the fundraiser wants to raise money below the curve, (i.e., the money was less expensive than the market price). The rate of return for investment along this curve is the definition of the market price. The risk vs. return tradeoff is the essence of understanding the real estate investment market. While there are many risk factors involved in real estate investment, there are five that are most important. For a more detailed understanding, please see our Risk Matrix. Tthe amount of debt relative to the price paid for the property. A building purchased for $1 million with a $750,000 loan would have a 75% loan to cost ratio. The higher the loan to cost ratio, the greater the cost of the debt service, and the greater the risk that the property company would default on their debt service if rental income decreased due to tenant default or failure to renew leases. In a primary market such as Manhattan, the extremely high demand for real estate means that prices are very high, but price volatility is very low. Real estate in primary markets may be compared to “blue chip” stocks in that price is relatively high and stable, risk is relatively low, and therefore potential for explosive growth is also relatively low. The opposite may be true in a suburban, exurban or rural market, where high levels of price volatility exist. Factors such as an economic boom or recession or a demographic shift could greatly affect demand for and therefore value of the property. The level of occupancy and the quality of the tenants greatly impact the risk of an investment. A 100% occupied residential building is a less risky investment than one which is only 50% occupied. A lease from a national corporate tenant (for example, Starbucks or Chipotle) is less risky than one from a local retailer or restaurateur. In the unlikely event that the corporate tenant closed the location, they would continue to pay their rent to preserve their credit rating. With a local tenant, the chance that they default on their rent is generally higher, and if they do default, your ability to collect the remaining rent would be diminished due to the fact that they would likely file for bankruptcy. An empty lot or a building in need of repairs requires more capital to get it to the point that it can be leased to a paying tenant, and is therefore riskier than a finished structure in good condition. A company which has an established track record of dozens or even hundreds of successful projects has a greater chance of bringing their next project to completion than a newcomer with only a few projects under their belt. In real estate, there are essentially three phases of development: ground up construction, value-add, and stabilized. 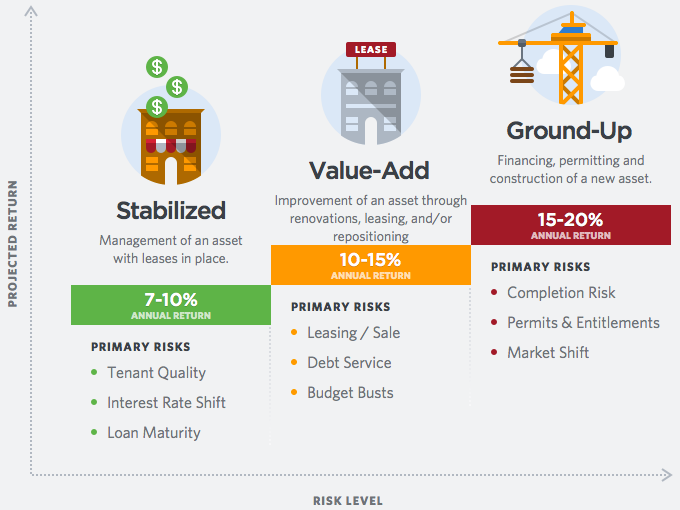 These phases represent the natural lifecycle of a real estate deal from birth to maturity. As with life, a project is much more vulnerable in its early phases but is pregnant with more potential growth. In other words, each phase entails more risk and usually demands more return to entice an investor. We created this graph to help illustrate the increasing risks by development phase. Here we describe the top risks associated with each development phase and an estimated annual return the market might generally expect for the equity investor. The earlier phases of development are more risky because they carry all the risks of the later stages, plus hold additional risks the more mature stages do not.